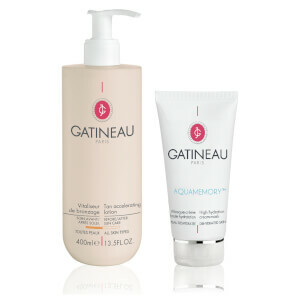 The new and improved Gatineau Tan Accelerating Lotion is a triple action formula to help prepare, boost and prolong tanning before and after sun exposure whilst encouraging the skin's natural self-protection through advanced-performance melanin production activators. This beautifully refreshing cream is instantly absorbed by the skin to help your tan develop faster with a healthy-looking, even and deeper colour which lasts longer and prevents premature skin ageing. Leaves the skin smoother and more supple with a satiny finish. Apply daily for a minimum of two weeks before sun exposure, then every evening after exposure and continuing use for several weeks. Can be used on face or body. Although initially sceptical, I trusted reviews & purchased this moisturiser. Sceptical no more this product is amazing! I’ve apples it as a normal moisturiser & my natural tan from minimal Bank holiday garden sunshine, is lasting beautifully. I can’t wait to see how good my tan is after 10 days in Crete this summer. Would not hesitate in purchasing this product again. The product is easy to apply, a little does a long way & it smells divine! Excellent tan accelerator, I have been applying daily since my holiday in June and I have not peeled at all plus my tan has stayed. Half price offer means I can continue to use it as a daily body moisturiser. Arriving very quickly with free postage too so I am very pleased. I can't be without this product. I have fair skin and have burned in the past and have suffered malignant melanoma. However with using Gatineau tan accellerater two weeks prior to holiday together with Ultrasun whilst there I never ever burn. Excellent!!! I was going to Majorca in early July for a week, but wanted a 2 week holiday tan! Used this as recommended before going away, on holiday and still using it now. After only a week in the sun I was very brown and still am 7 weeks later. Haven't peeled and tan hasn't faded. Amazing. Love this product. Does what it's says. Fantastic value, less than half price plus free delivery. Thank you look fantastic, will shop with you again. I can't really comment on the product yet as I have just bought it and am using it post tan as opposed to pre and post tan. What I do know is that the cream has a lovely texture and smell and is also extremely moisturizing. I have very dry skin on my legs and the cream certainly does a good job of moisturizing. I'm looking forward to using the Gatineau in the correct way in the future then I can ratify what it states to do. At the moment I am very happy with my purchase. This is at least my 4th year using this product....say no more! Please don't stop stocking it !! Purchased this product as I suffer from prickly heat when way in the sun, and all reviews mentioned how great this product is in helping control prickly heat. Used this every day for 3 weeks before my trip to Ibiza. Smells lovely, felt good on my skin. Good moisturiser. Second day into my holiday covered in prickly hear and blisters. Usually I get to day 5 or 6 before this happens. Did not help me at all. Using the same sun cream so actually made my skin more sensitive and sore. Disappointed. Brilliant product ,does what it says on the tin.